It had been a while since I’d last blogged, so I used my previous one to post on what I’d been up to. I deliberately didn’t mention the tragic events of February 10: the shooting of three students in Chapel Hill. It would’ve felt unnatural to cover this in passing or alongside other stuff that I’d been up to. I felt, and to an extent do still feel, like I needed more time to reflect. As I’m typing this I realise that I’ll be unable to find the impossible and craft words which could make sense of this. In and of itself a shooting in the town where one lives would be scary, but when we found out the next day that three students from the Triangle area of North Carolina were the victims it was beyond terrifying. Moreover given that the triple-murder is widely believed to be motivated by hate, one is rendered lost for words through disbelief, anger, and grief. Deah Shaddy Barakat, 23; his wife, Yusor Mohammad, 21; and her sister, Razan Mohammad Abu-Salha, 19, were all killed that afternoon by their neighbour. I was never lucky enough to meet them, but as with the rest of campus and the wider world was struck by stories of their kindness. A usually vibrant and cheerful campus darkened. Professors and students in my classes tried to talk through what we were feeling, attempting to support one another. 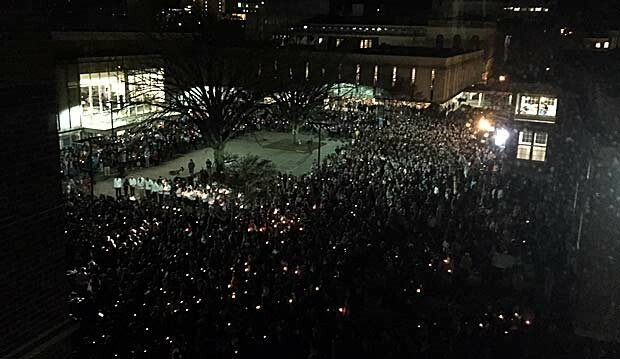 Thousands of people gathered in the centre of campus for one of many vigils held in the following days. With other students, I struggled to hold back my emotions as their friends and family told of their dreams which had been cut incomprehensibly short. I can’t even imagine what they are going through. Yusor was going to enrol in UNC’s School of Dentistry in Fall semester, having graduated from NC State in 2013, where Razan was studying architecture. Reminders were everywhere in the first few weeks, and still crop up from time to time. Walking to class through the quad and seeing a couple holding hands: reminded that Deah and Yusor had been married for just a few months. Seeing the crowd at a basketball or lacrosse game: reminded of the sea of students who filled the Pit. Sitting in a class, drifting off, and feeling guilty for wasting such time. One could be desensitized to reports of gun violence in the US. They cross the Atlantic with tragic frequency. They accumulate. Towering with what seems like a horrifying inevitability. But near the epicentre of such an event it becomes more personal, more painful, and more real.